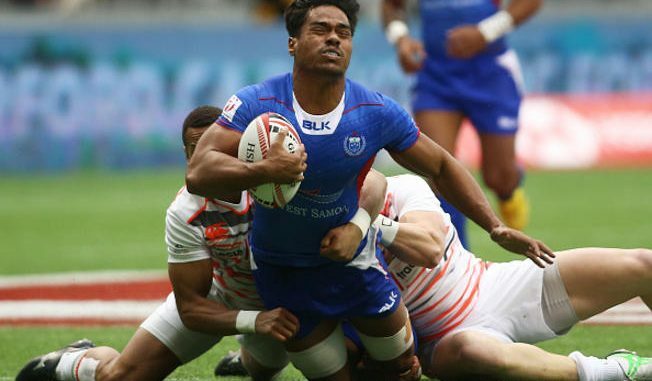 What a disappointment from Samoan rugby player at RWC 7s in SFO? It really puts a damper on such a wonderful World Cup hosted by USA. In my option World Rugby has to put a stop this from happening. Its not the first time Samoa Rugby players have been in trouble. Rugby was introduced to Samoa in 1920 by the Catholic religious order the Marist brothers and – given later results – few feel this was not a Christian act. Samoa full-back James So’oialo was accused of ‘malicious intention’ after grabbing South Africa’s Adrian Strauss’s testicles durimg a clash with South Africa earlier this year. Strauss responded by throwing a punch at him, which missed, and then chasing and swearing at So’oialo. I know from my time in New Zealand I did not look forward to playing against Samoan players who were know for there dirty play of late tackles, stiff arm hangers to name a few. Which brings us to present day: and the Gordon Langkilde charge of assault and three charges of battery at San Francisco court hearing after incident with Wales players off-field incident at AT&T Stadium in San Francisco after Samoa’s loss to Wales on July 22, as the teams headed from the pitch to the locker room area. Langkilde was taken into custody without incident at his San Francisco hotel on Sunday, the police said, after the Samoan Rugby Union (SRU) said it had provisionally suspended the player. “Langkilde, a visiting rugby player (Samoa) is accused of assaulting two players of another visiting rugby team (Wales),” read a police statement. The charges include three felonies and one misdemeanor. The Welsh players , sustained facial injuries, suffered broken facial bones as a result. A part from these disappointments off the field the USA did a great job hosting 2018 RWC 7s which are usually fun and exciting to attend. It was good to see our Canadians doing there best and will improve in the future. I bow my head to CBC for their excellent coverage with Nigel Reed and his broadcast team. Are These The World’s Best Dressed Men? © All Rights Reserved. Republish with permission only.